AAR 76, Rock you like a Hurricane! The last practice game before the back-to-back tournament weekends. OMG LW Doubles, put on by the Ottawa Miniature Gaming group (not, omg, a tournament!) and then our very own Dice Devils Fall Fubar MW tournament at the Legion. While I was painting a ME-262, Ca$h and Phantom played a game, and since I was painting, I didn't take any pics, but I got Vids, which as usual is below. After this weekend, I will put up a double tournament post, as well as the final few Hobby Articles for my Brits (don;t want to unveil until Fubar is done) so we have a few articles lined up in rapid fire coming up after this dry spell. "Loading these 'ere guns is tough work, 'ey mate?!" Turn 2, you can see my carriers are just within 4 of the crashed Hurr'c, but behind the hedges enough to not be seen. This forces Phantom to pitch models forward to contest turn after turn or lose the match. Yes its childish, but Phantom's felt table surface leaves cool track marks as I dragged my Churchies forward! I eventually lose my carriers, but by now my reserves are coming..
..including 6lbers who drive up and fire into the sides of ShermanIIIs.. So with the armor of most tanks I have been facing as of late, I decided to beef up my AT (anti-tank) abilities to enable myself to have a chance in later turns. Most of my games, my opponents have been fielding an abundance of tanks, to which I have no reply. My Marders have not been able to hit very much and the Panzer IV's are great, but once they are gone, held in reserve or find themselves in a US Tank Destroyer ambush, it's tough to recover from. PAK 40's seem to be the answer with a few modifications as far as chopping points up in my German MW Panzergren list. 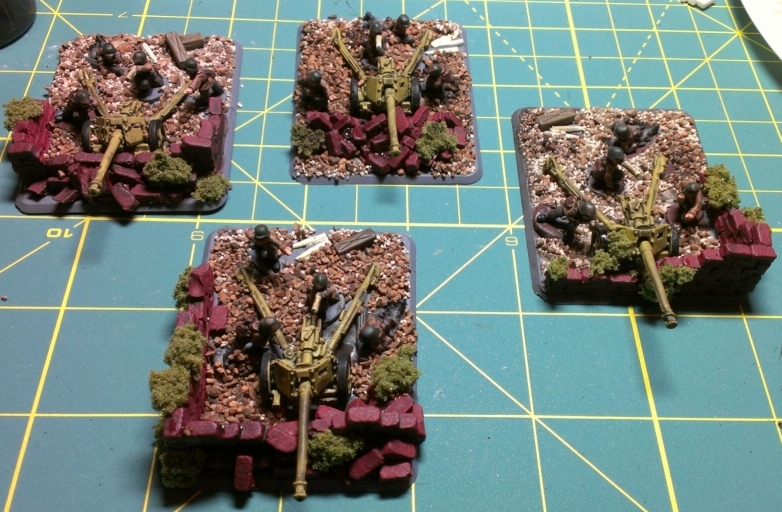 I had to make room for them, so out go the mortars and the PAK 38's for now and I'll likely be testing them out this Friday with the rest of their German brothers. For prep, the usual filing and light scuffing was done in order to prep them for basing. I went ahead and kind of pre-placed my soldiers around the guns before basing them separately from the guns themselves. This step saved me some time as it was way easier to paint the guns alone before they were mounted. A step I did not take when I did my Australian 25 pound guns. Overall, I went with a mix of browns and greens for my camo and the yellow/orange ochre look for the guns themselves. They are not quite as shiny after a wash and ended up turning out pretty good, although not as nice as I thought they would have. My buddy Dan built the walls you see in the pictures, they turned out great and really add to the bases. I would not recommend his 'brick by brick' method of assembly, as it must have taken him forever for them to get done where it started to look like a wall. I was messing around with some of the settings on my camera as I never like to just take a straight shot of something, I like lighting effects and other small features to make the painting and modelling more non-fake looking, if that makes any sense. ACHTUNG!! The bricks are not as red without my bright painting light. 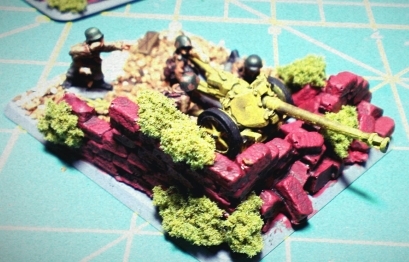 Eins...zwei...drei....vier PAK 40's ready for action! The very last Hurricane MkIV in flying condition, in North Africa colors. Pilot kept the flying pretty tame..
..unlike the P-40 Warhawk pilot, who was throwing it around the sky! LW 6pdr with muzzle brake. German finely made ammo box. Now I can color match my ammo crates on my 21 Panzer! Bofors AA gun on flex trailer. 15cwt truck, note yellow tonnage marker and unit colors, I need to fix my 15cwts now! In Canada we called this the Canso, better known as the PBY-4 Catalina. My dad got his start in aviation at the age of 4 riding in his fathers' company Canso, face against that observation blister behind the wing! Finally a video of the assorted clips from the event.